We offer flat rate shipping based on your zone. We are not responsible for partially thawed meat. If your meat is thawed and still cold, the product can be refrozen without effecting the integrity of the meat. If you are not planning on cooking the product the day of delivery, we suggest that you freeze our products upon arrival. When entering your shipping address, please make sure to fill in your complete address. We do not deliver to P.O. Boxes, A.P.O or F.P.O addresses. All of our meat is Illinois State inspected and processed. If dissatisfied with your order or if you do not receive your order, contact us at (618) 521-5102 within 24 hours upon receiving or the expected delivery date to resolve any issues. If we are not contacted within the stated 24 hour time period, we cannot help resolve any issues and will not replace any items. In the event that we cannot fulfill one of your items in your order, we will contact you. If we are unable to get ahold of you we will substitute your item for another item of equal or greater value. All of our meat is grass-fed and grain-finished, with no hormones or antibiotics added. After processing, our meat is vacuum packed and tightly sealed in durable packaging, then quickly frozen. When shipped, our products are placed in an insulated cooler with a box liner. To maintain the frozen state of our products, we use gel packs in our coolers. Upon receiving your order, you will find complementary recipes and helpful tips on cooking and preparing our products. 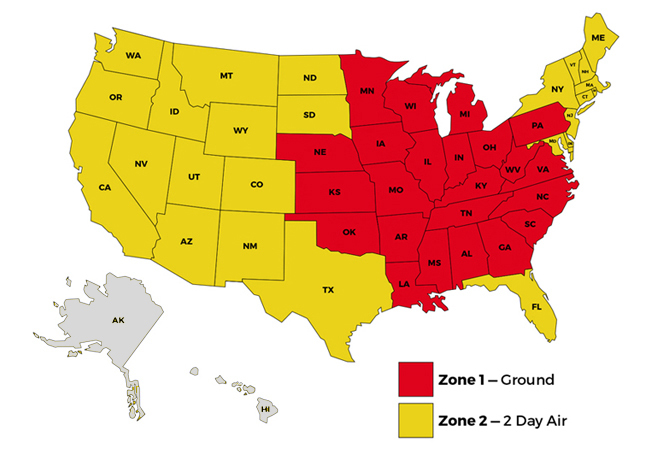 We offer flat rate shipping based on our zone map. We only use shipping methods capable of delivering your order in a time period that maintains the frozen or partially frozen state of our products. We are currently shipping on Tuesdays to ensure delivery by the weekend. Please make sure your order is placed by 3 p.m. (CST) the Monday before to guarantee your order is processed that week. Any orders placed after 3 p.m. (CST) on that Monday will not be processed until the following week. For special delivery date requests, please contact us at (618) 521-5102. We accept American Express, Discover, MasterCard, and Visa. All prices are listed in U.S. dollars and must be prepaid in U.S. funds. We do not ship outside of the United States, to Alaska, Hawaii, Canada, or Mexico. We apologize for any inconvenience. For orders over $1,000, please contact us at (618) 521-5102 to ensure you receive the quantity you desire and receive the best shipping method. When checking out, be sure to complete the shipping, billing and phone information accurately. Please note that shipments go out on Tuesdays. If needing to request a different shipping date, please contact us at (618) 521-5102 to set up different shipping arrangements. Remember the delivery date and be sure to have someone present to receive the order. Important: If the carrier has to take the order back, it could ruin the products. If not using the product on the date of delivery, freeze products immediately upon arrival. If dissatisfied with your order or if your order does not arrive on the delivery date, contact us at (618) 521-5102 within 24 hours of delivery or expected delivery and we will be sure to resolve any issues. Questions or concerns regarding any of the above shipping information? Please contact as (618) 521-5102 or bisonbluff97@gmail.com and we will be happy to help you. We reserve the right to make any changes to the shipping details at any time. Any changes will be updated on our website.